Andrea, you're so right about the butter. And cream. Lots of it. 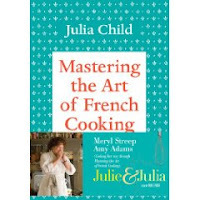 But Julia's recipe are clear, thoughtfully constructed, encouraging--she knows her readers. And heaven knows Julia has a sense of humor. And isn't that what we writers want for our picture book readers? Words deliciously tempting, meted out clearly, plotted with care, and sprinkled with a dollop of humor? Irresistibly tempting books: our goal. I think that's a perfect way to express it...we want irresistibly tempting books. Thanks, Edith. Wonderful review.I can't wait to see the movie.